The JVM4 range delivers an enormous arsenal of valve tone with vast flexibility, while the JVM2 range is its logical evolutionary partner, delivering JVM's sophisticated functionality in a refined format. Handbuilt with pride and meticulously tested in Marshall's world famous British factory, the JVM range comes in a variety of models to suit every guitarist. The JVM Series uses a carefully designed, 4 x ECC83 pre-amp stage to generate the desired amount of gain, from the cleanest, yet complex, clean imaginable to a vast palette of overdrives that range from sophisticated and subtle to explosive and extreme. 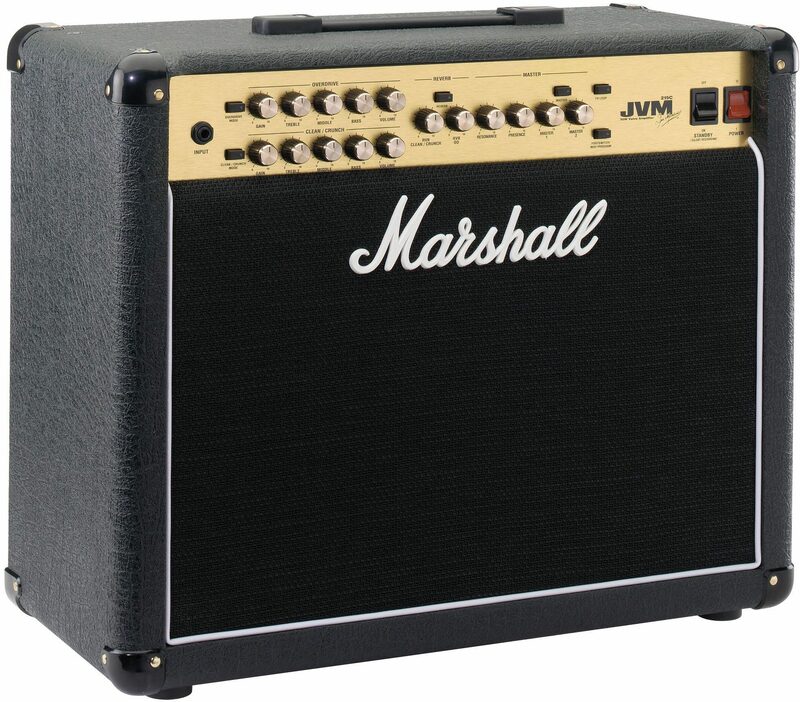 Boasting a truly amazing array of instantly switchable sounds, overflowing with harmonically rich tones and responsive fluidity, every JVM mode exudes that unmistakable Marshall sound and expands on it, effectively offering multiple Marshalls in one easy-to-use package. Each totally independent JVM channel offers three footswitchable modes which progressively add gain while offering a complimentary tonal topology, making the JVM the perfect amplifier for any situation. The JVM's layout is simple and uncompromising with dedicated Gain, 3-band EQ, Volume and Reverb for each channel. The Master section, featuring Dual Master Volumes, Resonance and Presence, finishes the concise layout, making each JVM a familiar "old friend" that's intuitive to use. Even with its programmability, multiple channels and modes plus switchable Reverb, FX Loop and Master Volume, each JVM is incredibly easy to navigate and understand. The onboard logic ensures swift silent-switching and remembers the position of each front panel switch in every mode: Reverb (on/off), FX Loop (on/off) and Master Volume (1 or 2). When returning to any mode, switch settings will be exactly as you left them, even after you've powered the amp down. This groundbreaking technology combined with revolutionary footswitch technology, plus MIDI switching capabilities, add even further to the JVM's already incredible flexibility. Ultimate Control and ConnectivityEvery JVM is supplied with a fully progh3ammable footswitch. This revolutionary, patent-pending technology allows single front panel switching (Switch Store) or entire set-ups (Preset Store - Channel/Mode, Reverb, FX Loop, Master Volume) to be simply assigned to any footswitch...or, even cooler, a mix 'n' match of both modes. Housed in a rugged metal casing with blank panels on its surface which allow the user to label the pedal exactly as they want, the JVM pedal has no restrictive factory set-ups or functionality barriers, plus it's a breeze to program. The multi-coloured LEDs reflect every front panel switch status so you know exactly where you are, in the heat of a performance, without the need to glance at the amplifier itself. The JVM's MIDI In and Thru connection means it can easily be integrated in a MIDI switching set-up, allowing you to store and recall 128 amplifier set-ups and enabling your MIDI effects board to easily control the amp. With its built-in memory and switching options the possibilities are endless! The onboard, studio quality Digital Reverb is routed in parallel (ensuring no digital degradation of the direct signal) and mixed with the direct signal by means of a valve. Specifically developed for the JVM, the Reverb retains signal clarity in its tail and low noise, analogue switching allows it to decay naturally when switching the effect off or changing channels. In addition, when the Reverb is switched off, it is totally removed from the circuit. Each JVM boasts two FX Loops that live on its rear panel. A footswitchable Parallel/Series Loop with Level and Mix controls plus a Series Loop with a Bypass switch. Combine the JVM with a MIDI FX processor and a MIDI footswitch and the sky's the limit! When on Standby, the JVM's emulated XLR output is fully operational, allowing you to record in total silence, a godsend for those late night recording sessions. Speakers aren't just there to move air, they're an integral part of an amplifier's tonal voice. To that end, all JVM heads have been designed to be sonically complimented by every single one of Marshall's vast array of 4x12" and 2x12" cabinet offerings. In the case of the 2x12 in. JVM combos, after exhaustive testing of every speaker available, all agreed that the pairing of a Marshall/Celestion 'Heritage' with a Marshall/Celestion 'Vintage' was the only way to go as the combination produces a fantastic depth and breadth of sound while maintaining a tight, musical response and a solid low-end thump. In the case of the 50 Watt 1x12" combo, a Celestion G12B delivers a full, wide sound that is much "bigger" than the JVM215C's compact size would suggest. Every JVM is made at the Marshall factory in the heart of England. Time-tested craftsmanship and construction are combined with advances in manufacturing technology, ensuring world-class build quality and roadworthiness.